The watercolor in today’s post is itself part of a continuum. It is based on yesterday’s post of my brother Mike’s changing expressions, which in turn was a compilation of posts from previous days (Dark-Eyed Mike #1, Frame #2, Frame #3). Mike is autistic, low functioning and nonverbal. As such, I have never been able to communicate with him on any meaningful level. The idea for this series of paintings came from a video transfer of an 8mm home movie that my father must have made of us kids, circa 1950s. Mike seems to undergo a sudden transformation in the third frame of the film. Although the reason for the transition was relevant to yesterday’s watercolor with regard to Mike’s story, I tried to excise that for today’s. I suppose a word for excising the original inspiration could be ‘abstracting’. Perhaps this rendition of the stills in my dad’s 8mm is divorced from its original meaning, but hopefully it provokes further meaning in the minds of others. 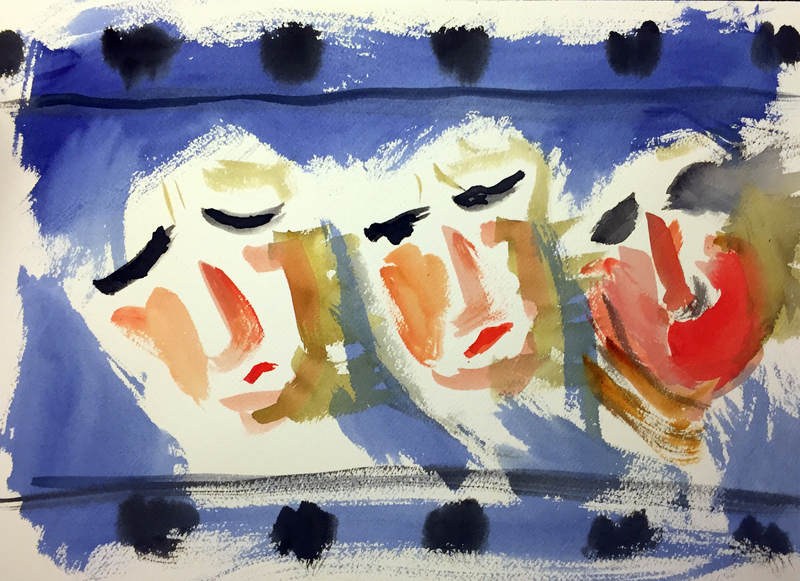 This entry was posted in Mike, Personal Stories and tagged abstract expressionism, abstraction, art, artistic process, autism, autism siblings, continuum, creative process, creativity, time, watercolor. Bookmark the permalink. You did a great job capturing expression in an abstract way. Very moving. Thank you, Claire. I appreciate that!